Dislocated joints happen when a bone slips out of its joint. The most common joints to dislocate are shoulders, fingers, and kneecaps. How do I know if someone has a dislocated joint? If someone has a dislocated joint they may feel pain, the area may be swollen, they won't be able to move the joint, and they may feel tingling around the joint, or further up or down the limb. How do I help someone who has dislocated a joint? apply ice to the joint to reduce any swelling. Don't apply ice directly to the skin, but wrap it in a cloth. If this joint dislocates a lot and you know how to put it back, put it back. But for most dislocations, see a doctor and get them to do it. Sometimes a dislocated joint will go back into place naturally. Even so, you may need an X-ray or treatment to help your ligaments and tendons heal, so it's best to see a doctor. it's a large joint, like a shoulder, go to an the nearest hospital Emergency Department. If the dislocation causes any pins and needles or numbness it's important to see a doctor straight away, to prevent permanent nerve damage. 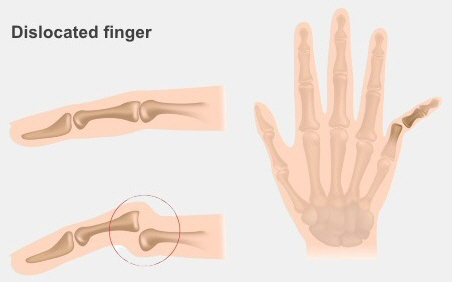 More information about what to do if someone has dislocated a joint or broken a bone.